Donna, this is SUCH a pretty tag!! You made EXCELLENT use of the SOL stamps. Love all the special little details you created! Thank you Deb! it was fun to make. 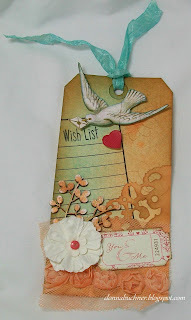 This tag is stunning Donna! Is this the one you've traded for the tag swap? Just curious. Thank you Elysia! glad you liked it.